Every summer growing up, we’d venture down to Hilton Head Island, old fashioned ice cream maker in tow. My mom would mix up a GIANT batch of her homemade ice cream custard, throw it in the fridge to chill and then we’d get to choose what flavor ice cream we wanted it to turn into! The majority of the time, it would stay vanilla, but our second favorite was peach! When we were at the beach just a couple of weeks ago, we tried to make it peach flavored, but the peaches just weren’t ripe enough yet. So, for kickers and to capture the wide-eyes of the 8 children in the house, I decided I’d stash a box of oreos HIGH up in the pantry for this special frozen treat. In a medium sized bowl, whisk the egg yolks and 1/4 cup of the sugar. Set aside. In a medium sauce pan over medium heat, whisk the remaining 1/4 cup sugar, heavy cream and whole milk together. Once the milk mixture begins to simmer, while whisking, pour a small stream of the hot milk into the egg yolks until the yolks are warmed and liquid. Pour the yolk mixture into the sauce pan with the remaining milk mixture and continue to whisk over medium heat, until thickened. Pour the custard through a fine strainer or cheesecloth into a large bowl. Place the custard bowl into a large ice water bath, stirring occasionally to help cool the custard down. Once the custard is a safe temperature (almost room temperature), place plastic wrap over the top of the custard and refrigerate for at least 2 hours or until chilled. Using your ice cream maker, churn the ice cream according to the manufacturer’s instructions. Once the ice cream is ready, pour half of it into a freezer safe container. Layer the broken oreos on the ice cream. Pour the remaining ice cream on top, spreading to make an even surface. Are you ready for another big giveaway? If you missed the last one it’s still not too late to go enter to win a ZOKU or OXO pack. Today’s Frozen Treat Week giveaway is brought to you by KitchenAid and King Arthur Flour! I’m in love with these two brands. I use my KitchenAid and my Ice Cream Maker Attachment like they’re going out of style. I’m also a huge fan of King Arthur Flour. You should see my pantry stocked full! Okay, enough chit-chat, are you ready? This post contains affiliate links. This giveaway has been sponsored by KitchenAid and King Arthur Flour. I did not receive any compensation for this post. Please read my disclosure policy for further information. Cookies and cream is my favorite flavour!! Love this! Totally love that first shot. Such a fun idea and such a classic ice cream flavor! 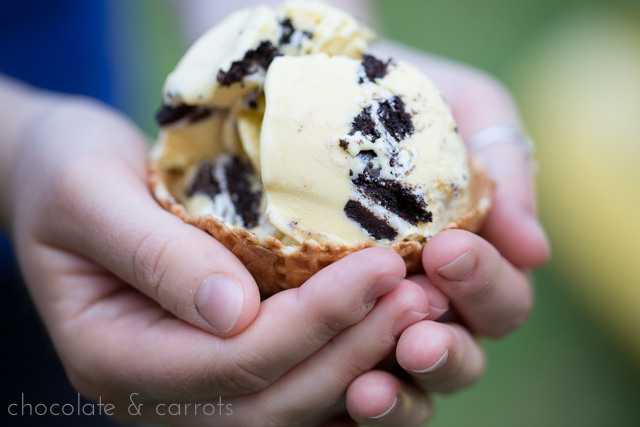 Oreos will always make me smile/a bit giddy…especially in ice cream form! The perfect summer treat! I don’t know who doesn’t love Cookies & Cream Ice Cream!! The thing is- sometimes I choose fruitier flavors- but then always regret it when Andy gets C&C and and have a bite. This looks like the perfect classic recipe! I am totally missing out by not making any frozen treats this week. I need to fix that. Delicious! This is one of my hubby’s favorite ice cream flavors – need to make it!! A KitchenAid mixer!?!? This would be the best thing that ever happened to me! You can never go wrong with the classics – cookies & cream is one of my favorites! yum! 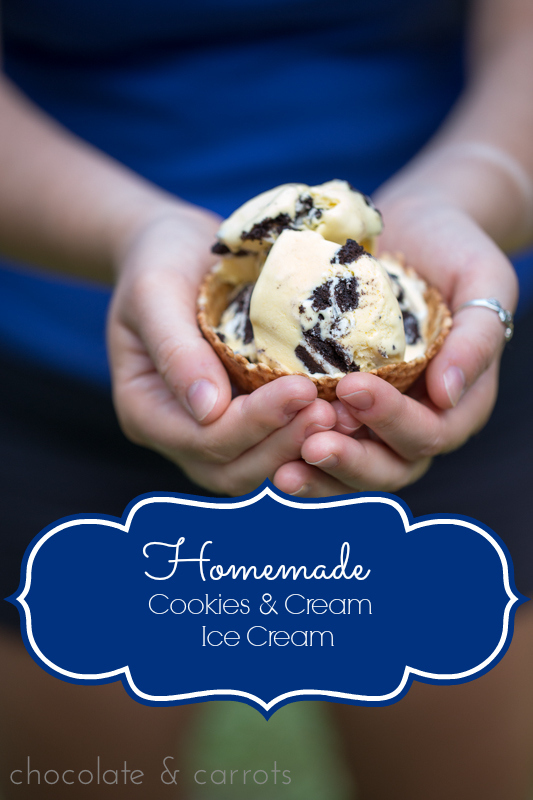 I love homemade ice cream–one of the first ice creams I’ve ever made from scratch was a cookies & cream ice cream. Haven’t made it since and need to change that STAT! I would not be able to stop eating this ice cream. I’m such a sucker for anything that contains Oreo cookies…yum! I would make cookies and cream ice cream!